The beer inside this bottle is our homage to the brewers who came before us; a tribute to those who paved the road on which we walk and discreetly left a breadcrumb trail for us to follow. It is for the beer geeks, the tickers and raters, and the newbies who opened their minds to try something new and unfamiliar. It is something that comes from our heart, an offering of appreciation for the supporting us and allowing us to play in the game. The beer in this bottle wouldn't exist with out you. Poured from a 750mL bottle into a Sante Adairius tulip glass. Not sure which batch this is, it could be 2 or 3. Thanks Jake for hooking me up with this bottle. Pours a cloudy maroon body with a very small white head that reduces quickly to leave a bit of spotty lacing and a thin ring of retention. Doesn't look too carbonated. 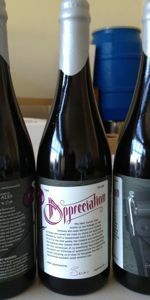 Aromas are fruity and ripe, very berry forward with a good amount of farmhouse character, vinous, red wine, tannic, hay fields, lactic tartness, cherries. On the tongue it's lightly tart with berries and cherry up first, tannic and dry, followed by red wine barrels and a lactic astringency, finishing lightly funky and juicy. Mouthfeel is lacking a bit, it could use some more carbonation but the body is medium-light and easy to drink. Overall I enjoyed this - my only complaint is the lack of carbonation. Good flavor and balance, not overly sour and lots of berries. 750ml bottle, served in a teku glass. Pours a clear, darker reddish-purple body, one finger thick white head, good retention, bits of lacing. Smell is heavy on the boysenberry, with a nice earthy fruitiness present as well as a bit of oak, touch of red wine and tannins, bit of fruity grape and lactic acid. Flavour is a nice fruity boysenberry, with a bit of earthy astringency, nice oak, tannic with a bit of vanillin on the backend, moderate acetic tartness hanging around throughout the palate. Light lemon as well. Mouthfeel is lighter medium bodied, good carbonation, dry boysenberry tartness with a fair bit of red wine tannins lingering on the finish. Nice complexity, with an interesting earthy astringency that takes a few sips to get used to. What a fantastic beer. Beautiful crimson color in the glass, smells of wine, oak, and berries. Just the right balance of the vinous character with the ripe tart berries and oak. Nice dry finish. This is seriously top notch stuff here. Oaky, funky, red wine, fruity boysenberries, hops to even it out. Taste is full of super fresh whole tart boysenberries, red wine barrel, funky oak.